Special Piping Materials celebrate 10 years in Scotland this July. 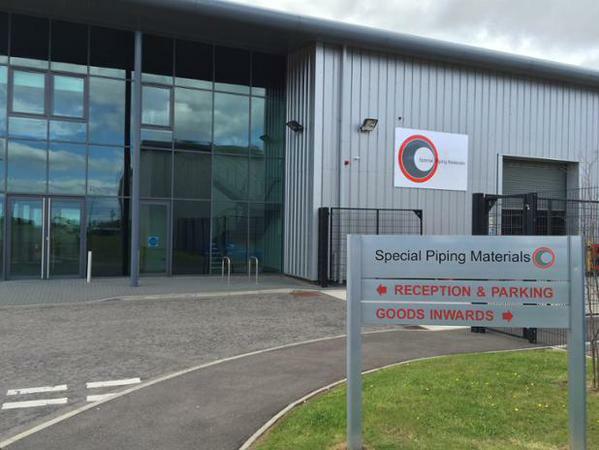 The regional office and warehouse, located on Moss Road, Gateway Business Park in Aberdeen, opened its doors for the first time in July 2007, and since then has enabled Special Piping to expand its operations from its crucial vantage point in the north of the British Isles. Back in July 2007, the site covered a mere 5000 square feet, contained just £150,000 of stock and was operated by only two staff, Jamie Hutchinson and Mike Ogston. But from those humble beginnings, the site increased in size considerably, and now plays host to £2 million of stock, stretches over 25,000 square feet and employs over 14 staff, 4 of which are celebrating ten years of service this year. The site itself is impressive and dominates the surrounding business park. It’s stunning glass and sheet metal construction is a masterclass in logistics design, facilitating all the business’s needs. From this key location, the company developed a range of partners in North Sea Projects and signed various frame agreements with major oil companies. The rise of SPM in Scotland reflects the company’s growth across the world. In 1989, Special Piping Materials had just one office located in England. But thanks to its innovative integration of international supply chains and its strategy for meeting clients’ needs, it’s since proven itself a valuable supplier to not only the oil and gas industry but also LNG, the nuclear power sector, water treatment firms and mining and minerals companies. The company hopes that these facilities will provide a base for further expansion in the region, especially given its lucrative offshore oil drilling industry – an industry which generates billions of pounds of revenue every year. Part of the success of the regional warehouse and office in Scotland comes down to the quality of the products it supplies to the oil and gas industries. As oil companies explore further out to sea and at greater depths and the risk of harsh corrosive environments increases, the demand for corrosive, resistant duplex products is becoming ever greater. SPM Scotland has succeeded over the last ten years in large part thanks to its ability to meet the needs of the oil and gas industry. SPM Scotland helps to coordinate the delivery of the kind of duplex products that companies want, including pressure-resistant products that do not crack at extreme depths. Turning to the future, the next stage for Special Piping Materials (Scotland) is to expand its relationships with major oil companies. There are still plenty of opportunities to grow in the region, and this means that it is entirely feasible that the company will see more dramatic increases in the size of the facility and the volume of material held in stock in the future. With the company’s commitment to quality, including sourcing all products from approved mills and testing to international standards, perhaps the facility will have grown another 10-fold by the year 2027. If the past is any guide, that’s what we would expect. Congratulations to everybody at Special Piping Materials (Scotland) for their hard work.